After months of “first of its kind” customer research, Brisbane Airtrain this week launched its ‘No Worries’ marketing campaign. The campaign aims to drive awareness of the Brisbane Airtrain service among interstate visitors, especially from key points of arrival such as Melbourne, Sydney and New Zealand. Local Brisbanites, especially fly-in-fly-out miners are a separate, important focus of the campaign. The campaign’s goals are to raise product awareness and to reduce perceived risks in its core customer segments. The campaign does this by promoting new physical and online improvements to Airtrain’s service. Using the familiar Australian ‘No Worries’ catch-cry, the campaign informs tourists and locals, how smoothly the Brisbane Airtrain link connects Brisbane Airport to the CBD and the wider Queensland Rail passenger network, including final destinations as far south as Beenleigh and the Gold Coast. 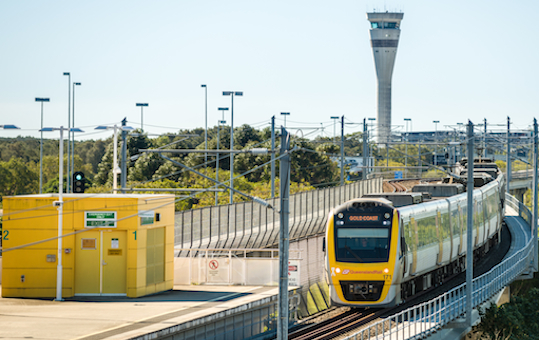 Airtrain’s website already offers Australia’s only combined air and rail e-ticketing system. The company plans to introduce a redesigned responsive website for even easier bookings. Newly installed wide-berth Go Card gates mean easier luggage transport and improved commuter flow. Basche served in marketing and CEO roles with Airtrain between 2005 and 2011. He rejoined the company as CEO in April 2014. His prior roles with Brisbane Airtrain explain the organisation’s strong customer focus and its marketing research driven business plan. Airtrain claims to be the cheapest and most efficient way of commuting between Brisbane Airport and the CBD. For the 24 minute trip, it offers trains from and to the CBD every 15 minutes during busy times and every 30 minutes during off-peak times. The Airtrain link commenced operations in 2001 and recorded more than 1.8 million passenger commutes last year. Brisbane Airtrain was acquired by Universities Superannuation Scheme in 2013, one of the UK’s largest pension schemes. USS also owns the Eastlink toll road in Melbourne and the Sydney Airport Rail Link. So, the marketing lessons, business improvements and strategies carried out by Brisbane Airtrain might in the near future be extended to its sister Sydney Airport link. The campaign was developed by creative agency BCM, with assistance from researchers Sprout Research, social and digital agency Liquid Interactive and public relations firm Crossman Communications.